#1 NEW YORK TIMES BESTSELLER • Red Rising thrilled readers and announced the presence of a talented new author. Golden Son changed the game and took the story of Darrow to the next level. Now comes the exhilarating conclusion to the Red Rising Trilogy: Morning Star.Darrow would have lived in peace, but his enemies brought him war. The Gold overlords demanded his obedience, hanged his wife, and enslaved his people. But Darrow is determined to fight back. Risking everything to transform himself and breach Gold society, Darrow has battled to survive the cutthroat rivalries that breed Society’s mightiest warriors, climbed the ranks, and waited patiently to unleash the revolution that will tear the hierarchy apart from within. Finally, the time has come. But devotion to honor and hunger for vengeance run deep on both sides. Darrow and his comrades-in-arms face powerful enemies without scruple or mercy. Among them are some Darrow once considered friends. To win, Darrow will need to inspire those shackled in darkness to break their chains, unmake the world their cruel masters have built, and claim a destiny too long denied—and too glorious to surrender.Praise for Morning Star “You could call [Pierce] Brown science fiction’s best-kept secret. In Morning Star, the trilogy’s devastating and inspiring final chapter, . . . he flirts with volume, oscillating between thundering space escapes and hushed, tense parleys between rivals, where the cinematic dialogue oozes such specificity and suspense you could almost hear a pin drop between pages. His achievement is in creating an uncomfortably familiar world of flaw, fear, and promise.”—Entertainment Weekly “There is no one writing today who does shameless, Michael Bay–style action set pieces the way Brown does. The battle scenes are kinetic, bloody, breathless, crazy. 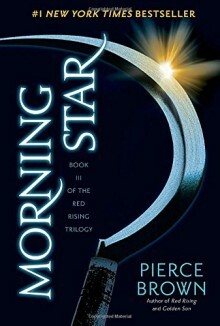 Everything is on fire all the time.”—NPR “Morning Star is this trilogy’s Return of the Jedi. . . . The impactful battles that make up most of Morning Star are damn near operatic. . . . It absolutely satisfies.”—Tor.com “Excellent . . . Brown’s vivid, first-person prose puts the reader right at the forefront of impassioned speeches, broken families, and engaging battle scenes . . . as this interstellar civil war comes to a most satisfying conclusion.”—Publishers Weekly (starred review) “A page-turning epic filled with twists and turns . . . The conclusion to Brown’s saga is simply stellar.”—Booklist (starred review)“Multilayered and seething with characters who exist in a shadow world between history and myth, much as in Frank Herbert’s Dune . . . an ambitious and satisfying conclusion to a monumental saga.”—Kirkus ReviewsFrom the Hardcover edition.